This screenshot is what the current layout looks like. 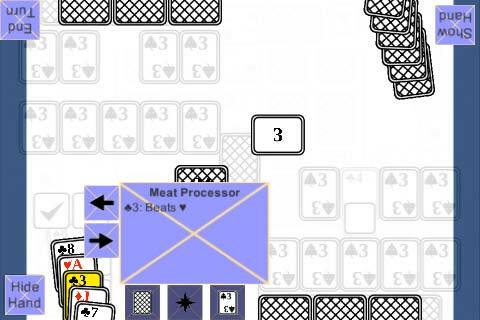 The rectangle with the 3 is the discard pile and all it’s going to do is update the number of discarded cards. I should probably move it and the deck more to the center so the info box doesn’t cover the number. I’ll do that another time. Coded a bunch of special abilities. I’d say roughly 50% of them are done. The next one on the list is a slightly more complicated one so it will probably take a while to get it working. What’s next: coding more abilities.